Defending the Crease. - Dalton Messina keeps a NTDP player a safe distance away from Chad Veltri as he makes sure he keeps control of the puck. And the regular season is a wrap with the Phantoms downing the NTDP U17s. Owen Gallatin got the NTDP on the board first. After making a great bank pass from his own end to the neutral zone to spring Hunter McKown, Gallatin jumped up from his defensive position to join the rush. McKown hit him traling the play and he put a shot on goal that somehow eluded Chad Veltri in net at 9:38. Despite being outshot 9-7, the NTDP carried the 1-0 lead into the first intermission. The Phantoms stormed back in the middle frame, starting with a powerplay goal. Joseph Abate, back for his second game after an upper body injury, hit Gianfranco Cassaro with a cross ice pass at the blueline. The defenseman was all alone as he carried the puck to the top of the left faceoff circle and unleashed a laser shot that beat NTDP goaltender Drew Commesso at 4:21. Matthew DeMelis put the Phantoms ahead after taking a pass from Ben Schoen near center ice. DeMelis danced around defenseman Connor Kelley, treating him pretty much as a pylon in a stick handling drill, and right by defenseman Jacob Truscott, before making a backhand to forehand move on the shot that beat Commesso at 12:17. Brett Murray added to the lead with a flurry of action around the NTDP net that ended with Connor MacEachern centering the puck to the USHL's leading goal scorer who burried his 41st of the season with 2:05 left in the period. 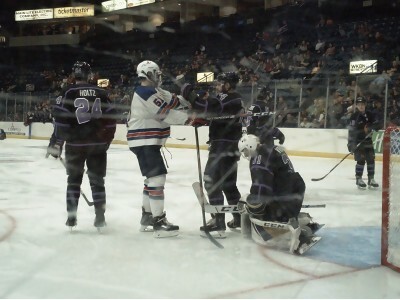 Shots were 11-10 in favor of the NTDP in the middle frame but the Phantoms put up 3 goals. Just for insurence, Brett Murray repaid the favor to MacEachern in the third. Murray stick handled the puck below the NTDP goal line before centering it to MacEachern in the slot. MacEachern was slightly handcuffed by the pass but managed to put a great backhand shot on net that found the back at 9:50 to round out the scoring. Shots were even at 8 per side in the third and 27-26 Phantoms total. Without help from Muskegon, who sat most of their top players against Chicago, the Phantoms end up in third place in the East. That gets us a 3 game series at home against Dubuque starting Monday. We had a little over 2,100 in attendance to close out the season. Our final average is officially 1,198, down about 171 from last season. That marks our third straight season of declining attendance. Ironicly, we made the playoffs the past three seasons. The only teams with lower attendance are the USA NTDP (1,132), Chicago (1,075), and Central Illinois (1,062). The latter has likely played their last game as a USHL team and will be dormant next season. Chicago is still recovering from an ugly ownership change a few seasons ago and the NTDP is a special case. I'm confident that the Phantoms new ownership is working hard to reverse the declining attendance trend and we'll see next season how successful they are. Anyway, we're heading to the post-season. I know it's short notice and the attendance is never good for the playoffs, especially when you play Monday, Tuesday and possibly Wednseday. We'll see how things go and maybe we'll see some weekend games by the Conference finals. As these games really conflict with my work schedule, I'm not sure how things will play out with recaps and previews. I do hope to get a short preview out as well as a quick episode of our Dump and Chase podcast. Until then, enjoy the only highlight I have from last night. Connor MacEachern with the backhander!